If life is created in the bedroom, it is most certainly lived in the kitchen. Share the conversations of family and friends, the recipes and the laughter. There is a chair at the table waiting for you! Summer Reruns, Moving On and Looking Back! KC Note: As most of you who follow Kitchen Clatter know, I am on the move and will soon be settled into a new home after a short trip to Maine with friends. It is going to be an exciting fall with all new blogs, details, recipes and more to follow shortly (or as soon as I can figure out the new modem to the internet!). For the next two weeks, the most popular posts from the last year will be featured. This first one, which was originally titled "My Own Modern Family and the "F" Bomb" still remains the most viewed and most shared post of Kitchen Clatters tenure. It was bought and published in a few newspapers and the memory of this encounter with my sons endures in my heart: If you weren't here from the beginning...take a look! For one month of each year, my children are the same age. After 10 childless years, we had two boys in an eleven month span. Not going into detail here, but sufficed to say we figured it out the problem with having the first one and the second one just surprised us. Having two kids this close in age is almost like having a set of twins where one is just a little smarter. Eleven months smarter to be exact, and that caused the older one to usually take the lead. And that is exactly what happened when they walked into my kitchen one day and asked to talk to me. They were seven and eight at the time. And if there is one thing I have learned in life is that whenever someone starts a conversation expressing the need to talk to you, it is never good. As I remember, their exact wording was “we have a question for you” but the premise is the same. “Okay”, I answered and sat down at the table so that we were eye level. The older one actually took a deep breath and then started, “If we are outside playing with our friends, and you can’t hear us, is it okay if we say ‘damn’?” It took me a minute to figure out what they were asking. The younger one stood looking down, nodding his head as if he was thinking “I knew this wasn’t a good ideal”. I am a huge Modern Family fan and would watch no matter what, but I Googled this crusader, McKay Hatcher, and found that his group is 35,000 members strong and is made up of mostly college age students. So maybe there is hope to curtailing some of the profanity that so easily laces our vocabulary. Mine included, on occasion. Yes, sadly, the “f” word is today’s “damn”. It’s used in any movie without a G-rating. You see the word mouthed from frustrated professional athletes. You hear it in conversation from people passing you in the mall. I have seen it on Facebook and Twitter. Its use has leaped from taboo to what seems to be an acceptable form of expression. Many years have passed since that treasured kitchen conversation with my boys. And I am sure that since, many things have been said and done by both of them that I do not want to know about. But at that young age, my own small modern family used such courage and honesty in even asking the question that I claim that morning as a victory. But still, I remember being confused on how best to answer. Part of me wanted to say “Think about this, guys, if I can’t hear you…….”, but I didn't want to put that thought in their heads. So, I went diplomatic. “When you feel the need to curse now, what word do you use?” They responded in unison “dag”. Damn, that’s awfully close. “Well, why don’t you use that for a little while longer” I suggested knowing there would be a time they would figure out that they didn't need to consult me on all of their choices. But, still today, my kitchen is always open, and I am grateful each time one of them still finds their way in to do just that. 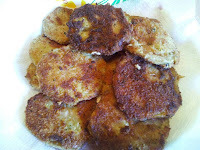 My Grandmother, Fried Eggplant and Jersey Tomatoes! Thanks Grandmom for creating the flavors of my memories! There is a scene in the movie "The Mirror Has Two Faces" where Barbra Streisand's character methodically rearranges the food on her plate so that with one swipe of her fork, she will have achieved the "perfect bite". That scene resonated with me because I believe that it does exist. When you can manipulate the savory with the sweet, the texture with the seasoning, some heat and a touch of salt...you have accomplished her goal. I did that tonight! I used the memory of my Grandmother and some vegetables, from a garden that is putting on quite a show as summer ends, to make my favorite seasonal meal. And with a little help from some Italian sausage...a feast was had! Years ago, in many Italian households, fried eggplants were made in place of cutlets when the budget dictated so. Skinning the eggplant before dipping them in a combination of egg and milk and then dredging through seasoned bread crumbs before placing in a hot, oiled frying pan activates the saliva glands as soon as your ears hear the sizzle! After slicing up some freshly picked sweet fryers and bell peppers, along with a vadalia onion, I browned up some Italian sausage and added the mixture to the pan. The aroma of the sausage, peppers and onions frying triggered a memory of sitting in my grandmothers kitchen on a summer's evening. The curtains would slightly blow in a soft breeze, while the scent of eggplants and sausage frying would escape through the screen. On more than one occasion, neighbors would yell in "Rose, what are you cooking that smells so good? And it was my grandmother who taught me the pleasure of dipping the golden brown eggplant into the juice of the tomato salad. 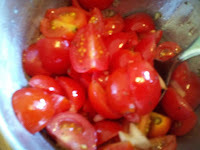 The breadcrumbs soak up the tomato-flavored oil like a sponge. Now, in creating my "perfect bite", I slice my sausage thinly, place it with a softly fried pepper onto the eggplant, fold in half and dip in the tomato salad! Perfect bite? Perfect summer meal!!! 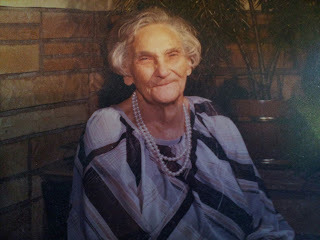 Grandmom, you'd be proud of me! There is very little that brings back warm memories like the aromas of the kitchen. I'm so glad I have them! 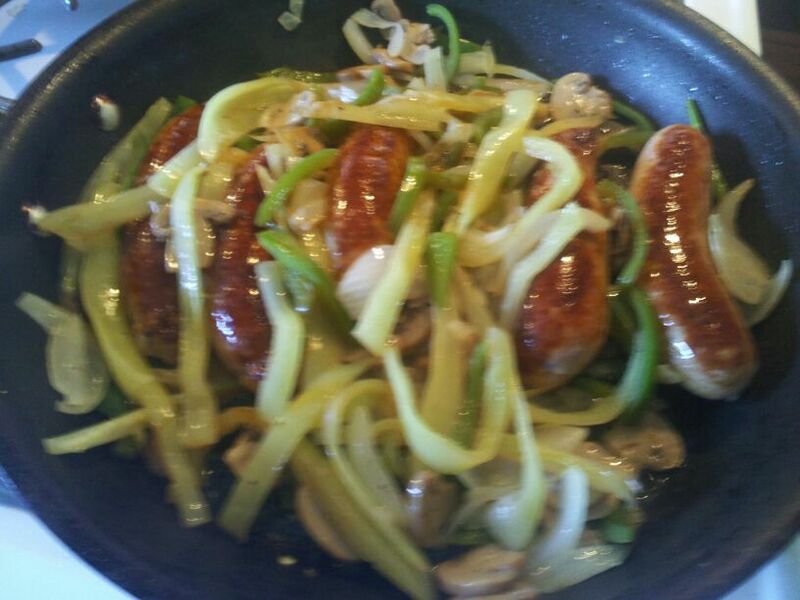 There is no better aroma than sausage, peppers & onions! Labels: fried eggplants, onions and peppers! kitchen memories, sausage, tomatoes. Keeping things in perspective was easy in almost every room but the kitchen. 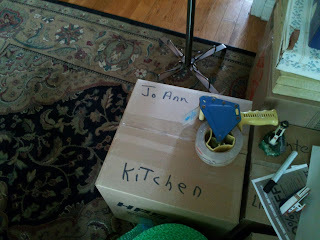 I'm embarrassed to admit that the strong emotions tied to cleaning out this one room surprised me. After all, this blog's mantra is "If life is created in the bedroom, it is most certainly lived in the kitchen." Each item picked up, wrapped carefully in paper, then stacked in boxes, sucked the life from that theory. We raised a family in this kitchen, we hosted parties and gathered large crowds for holiday dinners. We ate, we drank, we laughed...oh, how we laughed in this kitchen. 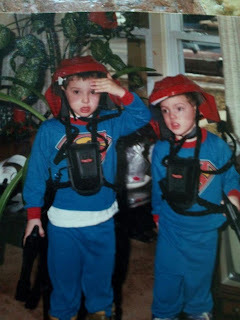 Some of my early Kitchen Clatter blogs tell of the conversations that took place while sitting around the dinner table with our two young boys, who still remain the lights of my life. I especially remember an early blog about a dinner time chat that surprised everyone. "While handing my oldest son who was in junior high at the time potatoes one night, I asked “How did things go for you today, bub?” He loaded his plate and responded “we learned how to put a condom on in health class. Pass the gravy please” That made me smile. As I struggled to stack big, heavy-bottomed pots, I thought of the many blogs relating to the soups my Dad taught me to make for cold winter Saturdays. And maybe this was not the greatest day to do this since this day would have been his 92 birthday and I was already wishing he was still around. But when I got to the cabinet that held the snowman mugs that I served my sons hot chocolate in on December mornings many years ago, I stopped. Enough was enough. Stop the Madness...Stop the Sadness!! I decided what I needed most was balance. The end of a marriage, the sale of a home and, more recently, the packing of its contents are like a one, two, three punch to the gut. It can double you over and take your breath away...if you let it. I'm thinking "no". I stepped back, called a friend, grabbed my handbag and went shopping for my new house. This will stable my equilibrium. Like a trapeze artist walking the high-wire, clutching a pole for stability, I can keep one hand on the work that needs to be done and the other reaching for the future. Balance. There is not much you can't do without it. And when I get back home, I'll pack the wine glasses. They are coming with me! Visit Jo Ann's profile on Pinterest. Riverton's Little House That Could...Did! Don't Let Riverton's Little House "Pass You By"! Riverton's Little House That Could! Do Overs...A Small Restaurant Comes Swinging Back! The Groom's Side Part II....I Have To Do What?